Rarely spontaneous along roadsides and edges of yards. First collected in 1986 in Hillsdale Co. by P. W. Fritsch. This Asian species is usually a much larger and longer lived tree than the peach. The pit is smooth rather than deeply sculptured, as in the peach. MICHIGAN FLORA ONLINE. A. A. Reznicek, E. G. Voss, & B. S. Walters. February 2011. University of Michigan. Web. 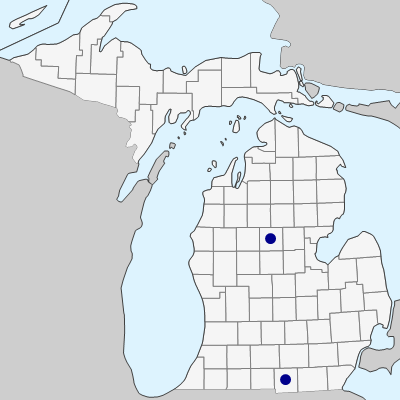 April 19, 2019. https://michiganflora.net/species.aspx?id=2518.